This is the Adafruit Feather M0 RFM95 LoRa Radio (900MHz) - our take on an microcontroller with a "Long Range (LoRa)" packet radio transceiver with built in USB and battery charging. Its an Adafruit Feather M0 with a 900MHz radio module cooked in! Great for making wireless networks that are more flexible than Bluetooth LE and without the high power requirements of WiFi. 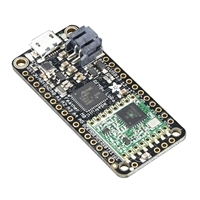 At the Feather M0's heart is an ATSAMD21G18 ARM Cortex M0 processor, clocked at 48 MHz and at 3.3V logic, the same one used in the new Arduino Zero. This chip has a whopping 256K of FLASH (8x more than the Atmega328 or 32u4) and 32K of RAM (16x as much)! This chip comes with built in USB so it has USB-to-Serial program & debug capability built in with no need for an FTDI-like chip. 2" x 0.9" x 0.28"